• In the first article, 3 options for LA’s waste disposal. What are they? • What is the estimated dollar cost of each option? • Are there other costs that should be considered? • What is the 4th option proposed by Councilman Greig Smith? • Is this an immediate option or a long-term solution? • Why does Councilman Smith want to pursue other waste options? • What option does Councilman Ed Reyes prefer? • Why do you think Reyes holds this view? • Why is the city budget woes discussed in this article, in particular the interruption by the Engineers and Architects Association? • In the second article, what plan did the Council vote for? • How much will the choice cost the city? • Is the contract cost the same as noted in the first article? Why the difference? • Which option did Councilman Eric Garcetti support? • Why do you think Garcetti holds this view? • Why did Mayor Villaraigosa support the Council’s decision? • What long-term options is the City Council pursuing? 2. Now that you have the back ground, what would you have voted for if you were a City Council member? In a paragraph (or two) state your position, and why you have chose it. Include mention of dollar, economic, political, and environmental costs. 3. With your last decision, you have taken care of the trash problem for the next 5 years. What solutions do you recommend for the future. Be creative, but keep it real. You must consider to dollar, economic, political, and environmental costs. Again, in a few paragraphs outline your proposal for the future of LA’s waste disposal. 4. You may need to do a little more research into the topic. I have provided some resources to get you started. Some of the material is very technical, and not always relevant. Don’t get too bogged down. This is supposed to be fun. Keep it simple. Ms. Burnham teaches Algebra 2 at the New Media Academy within Hollywood High School. Students, in case you need some extra background material in addition to what's on Ms. Burnham's blog, there's a lot here. The redesigned GPIA Web site is now live, and updated. Our goal was to create something that was informative and useful to GPIA members, residents of Glassell Park and to people who are not familiar with our neighborhood, or the GPIA. We also wanted the Web site to reflect the history of the GPIA and its dedication and contributions to Glassell Park over the years. 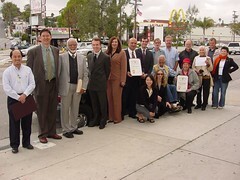 Whether you're a Glassell Park old-timer, newcomer, or passer-through, check out gpia.org and learn about the community. On Saturday, I attended the massive march to protest H.R. 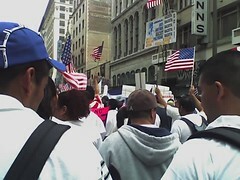 4437 and to support immigrant rights. Official estimates put the march at 500,000 people, though I think that's somewhat of an underestimate. Being a veteran of protests, I thought I've seen everything but I've never seen anything like this. The protestors were told to bring American flags and wear white shirts to symbolize peace. The mood was upbeat and fun, and, as was widely reported, there were no arrests or injuries. Latinos of all backgrounds-immigrants, U.S. born, students, elderly, families, activists, regular folks-came out to make this the largest protest in Los Angeles history. The Mayor, along with other elected officials, spoke to the crowd from the south steps. Navigating the space was tricky yet everybody was courteous to one another; nobody was pushing or shoving. Everywhere I looked was a sea of white shirts, and it was truly inspiring. I believe this Saturday marked a turning point in the immigrant rights movement. By exercising our First Amendment rights to assemble and protest, we made our voices heard in the halls of Congress, new immigrants became part of the political process, and a new generation of activists was born. I was in City Hall on Monday when groups of students, including many constituents of mine from John Marshall High School, walked out of classes to continue the protest. I came down and addressed the crowd, and listened to some of them talk about their fears and hopes as the sons and daughters of immigrants, and in many cases immigrants themselves. It's been a truly historic weekend in Los Angeles, and I am full of hope that Washington will hear the chorus rising together from the churches, the government, the schools and the streets and will make progress on a sane, humane immigration policy. Now you can take the Red Line to Union Station and catch a bus to the airport. Van Nuys has had this service for a few years, but this provides a great option to get airport travelers' cars off the freeways and to their flights on time. The price for the ride is a bargain at $3—and until the end of March, it's free if you arrive at Union Station via public transit. 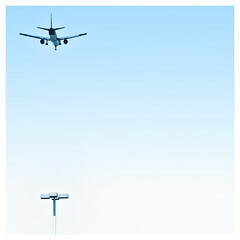 LAX and Van Nuys Airport. From March 15 through March 31, all riders who take public transportation to Union Station (Metro Rail and buses, Metrolink, Amtrak, DASH, municipal bus systems and taxis) are entitled to a free roundtrip ticket on the FlyAway service. I hope to see you there. Here's a .pdf of the Greenfilms program; the full schedule appears below the fold. Also: my good friend and colleague Jan Perry will appear at the panel on labor and film in her role as a member of the California Film Commission. It's tomorrow, Friday, at 8 pm at the Arclight and she'll be speaking along with Sally Field, State Senator Gloria Romero, AFTRA president John Connolly, Chancee Martorell from Thai CDC, Rick Jacobs of Brave New Films, and Stacy Taylor, past president of the California Women Firefighters Association. More info here (.pdf link). A great panel! The world is being challenged. For the first time in human history, the majority of the world's population lives in urbanized areas. The way of life of indigenous people is threatened. We are witness to ecological devastation-every day and on a global scale. One answer: working to achieve sustainability-living off nature's income rather than consuming its capital. 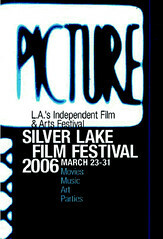 This year the Silver Lake Film Festival will present a selection of some of the most riveting documentaries on the state of the planet, along with a panel discussion with environmental experts and leaders. This gripping documentary portrays five remarkable Native-American activists who are fighting an ongoing battle to preserve their cultural and physical heritage against encroaching multi-national energy companies, our own government and the dismantling of 30 years of environmental laws. The Salton Sea, once a prosperous and popular resort area, has met a fate that is both horrifying and fascinating. Narrated by John Waters. A Sundance Film Festival favorite. Liberals battle conservatives in a struggling Oregon timber town, jeopardizing a 40-year-old college scholarship plan for every local high school graduate. The rise and demise of what was once our nation's richest agricultural area-the Los Angeles Basin-reveals our city's hidden history through the eyes and voices of noted urban historians. Narrated by Ted Danson, and featuring an interview with Robert Redford, this is the story of the "greenest building" in the world-the Southern California headquarters for the Natural Resource Defense Council. How do you build a gorgeous home AND make it better for the environment? This first show in the soon-to-be-seen PBS home improvement series will show you how. Next Monday night, March 27, at 8 pm, I'll be appearing as a special guest on Robin Johnstone's half of "The Blank Blank Show" at Improv Olympic West on Hollywood Boulevard. Bill Cody, a friend who has his own segment that night, thought it would be a fun way to create some interaction between local government and the audience for live comedy. And I'm a strong believer in having local government use different forms of communication—hence my appreciation for blogging. The show is an offshoot of the Improv Olympic's popular Thursday night Big News Show. I've been told that the format is somewhere in the neighborhood between The Daily Show and The Colbert Report. If you'd like to see your councilmember in uncharted territory, tickets are available at iowest.com and at the door. My colleague from the great 10th District, Councilmember Herb Wesson, was a stand-up comedian in a former career; for my part, I will simply be sitting for a live interview with Robin, the host. On Monday morning, a nine-year boy was walking to Mayberry School in Silver Lake when a man tried to abduct him. The boy kicked his assailant and ran home. While police investigate, Silver Lake neighbors have banded together to form a "Walk Watch" in the neighborhood. If you'd like to help, but don't live in the area, Addie is also looking for donations to cover the cost of "Walk Watch" shirts for volunteers. Courtesy of John Marshall High School, this week's council sessions will feature yet another improvement to the council-going experience. With the help of Elysian Valley United leader Steve Zimmer, the four students pictured here will be helping visitors to the John Ferraro Council Chambers to navigate the often-confusing council meetings. 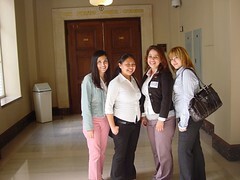 Look for (from left)Michelle Garcia, Pricila Hernandez, Tracey Molina, Meri Melikjanyan, and their colleague Jose Avila (not pictured) will be available to answer questions you might have about the agenda or public comment, or to deliver a message to a council staffer for you. Don't be afraid to ask them the tough questions—they're getting course credit. My first week serving on the City Council, a little item known as the Glendale Boulevard Transportation Plan showed up on the council agenda. The project was envisioned to transform this section of Echo Park from a cut-through motor speedway into something better, more manageable, more environmentally friendly, and more aesthetically pleasing. But absolutely no one was happy with the version we had. I called time out. "Let's send this back to the drawing board," I said. It was the perfect opportunity to test out two of my hunches about public service that others might find contradictory: one, that empowering the public leads to people saying yes instead of no; two, that city bureaucrats are creative professionals whose talents are rarely recognized, and when given the opportunity and space to show what they can do, they'll surprise even the most skeptical community members or elected officials. Five years later, Glendale Boulevard is a different street, and both of my hunches—and the initial vision of Viennese architect and UCLA grad student Silja Tillner—paid off. My thanks go out to the community members who joined the Community Action Committee: Judy Raskin, John Clyatt, Pete Lassen, and Michael O’Brien. And an equally full-throated shout-out goes to the city officials who worked on the project, Bureau of Street Services director Bill Robertson and Department of Transportation Engineer Farhad Zaltash. They weren't alone, but they were true leaders and got the city to do things it didn't know how to do before. Dozens of trees have been planted in the median and surrounding parkways; Community Action Committee member Michael O'Brien came up with a way to preserve many of the trees we had originall, instead of planting all news one. We put in decomposed granite along with drought tolerant plants and a new irrigation system. We implemented a left turn arrow at Alvarado & Sunset, a crosswalk at Reservoir, a signal at Aaron Street, turn restrictions at various intersections and new crosswalks. The Alavarado light at Glendale got faster, going from five cycles to three cycles. There's more to come: the 2 Freeway terminus into Glendale Boulevard remains an object of study. You can get involved with reshaping the way many people first see Echo Park by contacting my office. 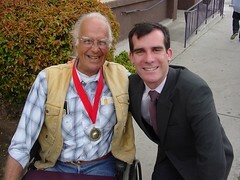 And one more thing: in the picture below, Pete Lassen is wearing a medal commemorating 10 years of participating in the Los Angeles Marathon from a wheelchair. Congratulations, Pete! The Los Angeles Times' City Hall reporter, the Pulitzer Prize winning Steve Hymon (he won for his work on the Times' series two years ago on the King-Drew Hospital), recently launched a test to see if two fish could survive in water Mr. Hymon drew from the Los Angeles River. 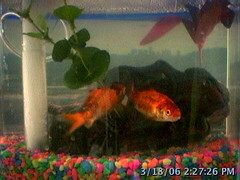 Then the plot, or water, thickened, as the Times put a web cam next to the fish, which Hymon named Little Antonio and Little Ed, after Mayor Villaraigosa and Ad Hoc Committee on the Los Angeles River (where I serve as Vice Chair) Chair Councilmember Ed Reyes. The city is currently implementing a number of strategies to clean up the water of the Los Angeles River, our local lakes (like Echo Park Lake) and the Santa Monica Bay and Harbor, using funds from Proposition O, the voter-supported ballot measure that Councilmember Jan Perry and I put on the ballot in 2004. Next one in the pool is the Department of Recreation and Parks with tales of fish, flowers, forts and fun. It's been a good week for e-access to your local government. Yesterday, the Los Angeles Police Department re-launched its web site, giving Angelenos a new look at law enforcement in L.A. 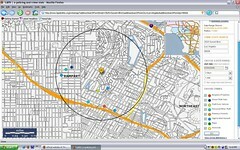 There are a number of new features, including the "Our Communities" page, which provides links to your local police division; the promise that emails to division commanders will be returned; and, most useful, an incredible maps section that allows you to map crime within 1-5 miles of any address in the city over any 1-7 day period. Inspired to take action? Visit the new "Get Involved" page to find out more. CD13.com readers are probably familiar with the LAFD News & Information Blog, where the dedicated Los Angeles Fire Department News and Media Relations staff fill readers in on traffic injuries, apartment fires, and local heroes. Bloggers Brian Humphrey and Jim Wells also scour the web to see where they can be of service, and can often be found answering questions in the comments at blogging.la and other sites. Now they and I are joined by the newest entrant in L.A.'s civic blogosphere, new Animal Services General Manager Ed Boks. At his new blog, you can read his speech to animal welfare advocates or his statistics on falling euthanasia rates.